Wherever mobile money touches down–whether in the Philippines, Kenya, or Haiti–it is touted as the next big thing in development. M-PESA in Kenya was lauded as a success because it provided financial services to thousands of poor, previously unbanked people. Mobile money has arrived in Haiti with the same aim: it is a commercial enterprise but it is also has development potential for the 80% of Haitians who are unbanked. Whether mobile money achieves its development goals depends upon the commercial viability of mobile banking and its adoption by the target population. Our research to date suggests that mobile banking in Haiti is commercially secure despite the small size of the current market. Mobile money may have taken years to be developed in Haiti if it were not for the incentives offered by the Gates Foundation (Haiti Mobile Money Initiative). A similar story operates with respect to mobile money outlets. It is in the interests of small businesses to sign up for mobile money because it requires very little initial investment, is not labor intensive, and has the potential to bring in new clientele. Outlets must be registered businesses who have passed a credit check with the mobile money service's partner bank and attend a one-day training seminar (or send an employee). The only technology they need in the site of their business is a mobile phone. Some outlets are complaining that they are not seeing any benefits in this early period, but they have no intention of pulling out and do not seem to be discouraging other businesses from signing up. This augurs well for the growth of outlets. The willingness of businesses to become outlets is crucial to mobile money's success as a development project. 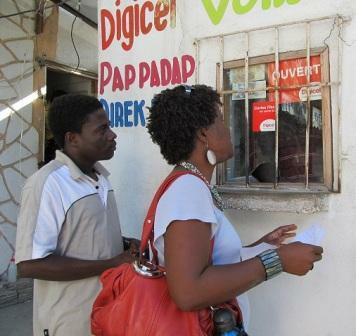 Mobile money will only succeed in reaching Haiti's unbanked if outlets are more widespread than any other formal financial service. If outlets are not nearby, people will stick to their tried-and-tested informal routes of money transfer (friends, buses, boats) and continue to store money in their homes. Mobile money will be commercially competitive if outlets achieve the same saturation as transfer services like Western Union and MoneyGram, but as a development project outlets also need to be located in remote areas. In this case, outlets and their access to banking facilities and reliable mobile infrastructure will be the main technical factors limiting where outlets operate. Accessibility is not the only obstacle to widespread registration for mobile money services. Education and literacy may prove to be serious stumbling blocks for both the commercial and development sides of mobile money. First, people need to know that mobile money exists, what it can be used for, and how to access it. T-Cash is currently advertising on Radio Caraibes and we have seen people on the street wearing bright green t-shirts that display the T-Cash logo and price list. Digicel will launch its advertising campaign in late April. So far we have encountered numerous people in Port-au-Prince who have heard about mobile money but do not know what it is for or where to find it. Indeed, they keep asking us to teach them about it, thinking that we are Digicel employees. Once people are convinced of mobile money's value and have signed up, they also need to be shown how to use the service by an agent, an outlet, or by friends. Our major concern here is literacy. 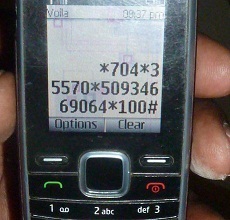 Most Haitians are numerically literate and have no problem using a mobile phone to make calls or check their balance. This is fine with T-Cash, which only requires a string of numbers to be entered. 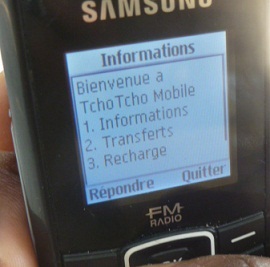 But TchoTcho Mobile customers must be able to read the French-language menus to make a transaction. 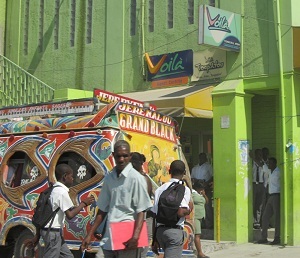 It is curious that the simplest form of banking in Haiti requires the highest literacy rate, whereas formal banks do not require any literacy at all because the teller fills in the customer's form. 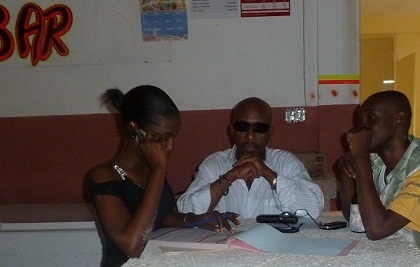 Technological literacy and access is also an imperative, as it is not uncommon for Haitians to use their phones (or other people's) to make calls and nothing else. Currently, mobile money is well positioned to appeal to a particular demographic: it is likely to work best with people who are already well connected, literate, urban, young, and employed. We feel that mobile money has a significant chance of bringing large numbers of Haitians into the formal banking system. However, if it is to help the poorest and most marginalized Haitians, targeted development programs that build upon the intricate relationships between the economic and social should run alongside commercial activities.